Screenshot is one of the most important part of share image from one person to another after taken print or it is transfer of Data from one place to another after taken screenshot of your image, window etc. 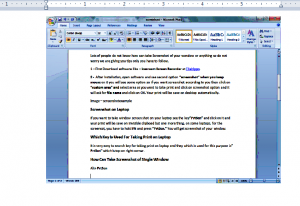 When you want printer of window or article or link in article, you can easily draw with the help of screenshot software and can send to your friend or client with email. 1 – First Download software like – Icecream Screen Recorder at Filehippo. 2 – After installation, open software and see second option “screenshot” when you keep mouse on it you will see some option so if you want screenshot according to you then click on “custom area” and select area as you want to take print and click on screenshot option and it will ask for file name and click on OK. Your print will be save on desktop automatically. If you want to take window screen shot on your laptop see the key”PrtScn” and click on it and your print will be save on invisible clipboad but one more thing, on some laptops, for the screensot, you have to hold FN and press ”PrtScn.” You will get screenshot of your window. It is very easy to search key for taking print on laptop and they which is used for this purpose is” PrtScn” which is top on right corner. Only open word and past on it and save so it is very simple method to you.